Alex Grande identified secure and resilient microgrid solutions at Fort Bragg. The Department of Defense and the U.S. Army are challenged with securing steady resource inputs that are jeopardized by damaging weather events, equipment failures and cyber-attacks. Fearful of what could happen in the case of a power outage, the U.S. Army Garrison Fort Bragg enlisted Alex Grande to ensure energy security by studying how microgrids could build resiliency. Identify goals and criteria for energy security and resilience projects. After reviewing several documents and funding programs, Grande identified the Energy Resilience & Conservation Investment Program as the most appropriate fit. Identify a location for a microgrid. Grande found 32 mission-critical facilities that were ideally situated. He analyzed diesel generation, solar PV, biomass, anaerobic digestion and battery storage across key metrics, such as savings, resiliency and emissions, and evaluated which technologies the base could use to meet electrical demands. Assign a dollar figure to resiliency. He used the Value of Electrical Energy Security model to estimate that the value for electrical security for Fort Bragg. Using a mix of on-site renewable, alternative energy resources and battery storage to power critical facilities would offset 72,000,000 lbs of CO2 emissions. This brings the value of electrical security close to $400 million annually. As a result, Fort Bragg can be fully autonomous during a prolonged power outage. And, having a dollar-value for electrical security allows the team to better analyze base operations without having to compete for funding with other installations in the U.S. military. Alex is passionate about energy and is inspired by how universal the impact is. 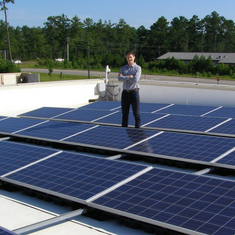 His experience spans PV installation to solar service operations, LEED GA accreditation and researching automated metering, smart and microgrids. He hopes to create energy solutions around the world, particularly in places without access to this technology.